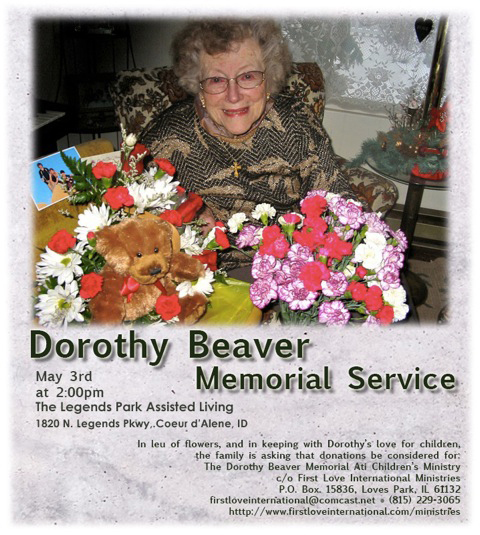 Memorial services have been announced for Dorothy Beaver, former missionary to the Central African Republic, who died March 28 in Coeur d’Alene, Idaho. They will be held at 2 p.m., May 3 at The Legends Park Assisted Living, 1820 N. Legends Pkwy, Coeur d’Alene, Idaho. In lieu of flowers, donations are requested to the Dorothy Beaver Memorial Ati Children’s Ministry, for the Philippine Atii primitive tribal people. Send a check to First Love International, P.O. Box 15836, Loves Park, IL 61132. 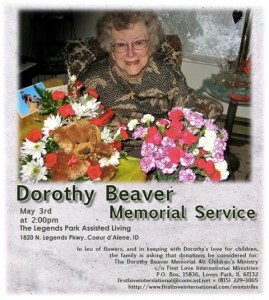 Click here to read the complete obituary for Dorothy Beaver.